These special Angel candle toppers are designed to fit most standard candle jars. Each of these unique candle toppers has a Tiny One Angel mounted on it that will allow you to remember your special pet in a beautiful, heart-warming way! 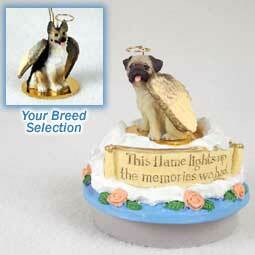 Featured on the candle topper is a plaque that reads: "This flame lights up the memories we had", 218 Dog Breeds available. (Candle not included). Fits candles with openings 2 15/16 diameter. Hand painted and sculpted to look detailed and realistic in stone resin.